This week we started to put together a new aquaponics system. 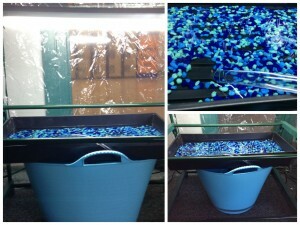 We took a large flexible bucket (where the fish would be), filled it up with water,and put two trays (one inside of the other)on top where the plants would grow. One tray has holes all over the bottom which drains the water into the tray below it that only has holes in the middle to drain into the bucket. There is a pump and tube coming out of the bucket and into the tray, bringing water up. The water drips through the holes and back into the bucket. We like this system better than the first one, because it is much simpler and takes up less space. It has been pointed out to us though, that it may not be leak proof but for now we will let it run and see how it does. We are also designing and drawing out more plans to make it even better.